A Mars habitat is a place that humans can live in on Mars. Mars habitats must contend with surface conditions that include almost no oxygen in the air, extreme cold, low pressure, and high radiation. Alternatively, the habitat may be placed underground, which helps solve some problems but creates new difficulties. One challenge is the extreme cost of building materials for Mars, which by the 2010s was estimated be about US$2 million per brick to the surface of Mars. While the gravity on Mars is lower than that on Earth, there is increased solar radiation, temperature cycles, and the high internal forces needed for pressurized habitats to contain air. To contend with these constraints, architects have worked to understand the right balance between in-situ materials and construction, and ex-situ to Mars. For example, one idea is to use the locally available regolith to shield against radiation exposure, and another idea is to use transparent ice to allow non-harmful light to enter the habitat. Mars habitat design can also involve the study of local conditions, including pressures, temperatures, and local materials, especially water. Significant challenges for Mars habitats are maintaining an artificial environment and shielding from intense solar radiation. Humans require a pressurized environment at all times and protection from the toxic Martian atmosphere. Connecting habitats is useful, as moving between separate structures requires a pressure suit or perhaps a Mars rover. One of the largest issues lies in simply getting to Mars, which means escaping Earth's atmosphere, sustaining the journey to Mars, and finally landing on the surface of Mars. One helpful aspect is the Mars atmosphere, which allows for aerobraking, meaning less need for using propellant to slow a craft for safe landing. However, the amount of energy required to transfer material to the surface of Mars is an additional task beyond simply getting into orbit. During the late 1960s, the United States produced the Saturn V rocket, which was capable of launching enough mass into orbit required for a single-launch trip holding a crew of three to the surface of the Moon and back again. This feat required a number of specially designed pieces of hardware and the development of a technique known as the Lunar Orbit Rendezvous. The Lunar Orbit Rendezvous was a plan to coordinate the descent and ascent vehicles for a rendezvous in Lunar orbit. 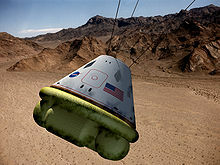 Referring to Mars, a similar technique would require a Mars Excursion Module, which combines a crewed descent-ascent vehicle and short stay surface habitat. Later plans have separated the descent-ascent vehicle and surface habitat, which further developed into separate descent, surface stay, and ascent vehicles using a new design architecture. 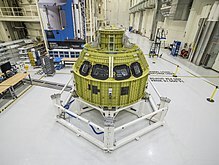 In 2010 the Space Launch System, or growth variants therefore, is envisioned as having the payload capacity and qualities needed for human Mars missions, utilizing the Orion capsule. One of the challenges for Mars habitats is maintaining the climate, especially the right temperature in the right places. Things like electronics and lights generate heat that rises in the air, even as there are extreme temperature fluctuation outside. One idea for a Mars habitat is to use a Martian cave or lava tube, and an inflatable air-lock was proposed by Caves of Mars project for making use of such a structure. The idea of living in lava tubes has been suggest later, noted for its potential to provide increased protection from radiation, temperature fluctuation, Martian sunlight, etc. An advantage of living underground is that it avoids the need to create a radiation shield above ground. Another idea is to use robots to construct the base in advance of human's arrival. The use of living plants or other living biologicals to aid in the air and food supply if desired can have major impact on the design. An example of how engineering demands and operational goals can interact, is a reduced-pressure green house area. This would reduce the structural demands of maintain air pressure, but require the relevant plants to survive at that lower pressure. Taken to an extreme, the question remains just how a low a pressure could a plant survive in and still be useful. A Mars habitat may need to focus on keeping a certain type of plant alive for example, as part of supporting its inhabitants. The study noted two plants, duckweed (Lemna minor) and water fern (Azolla filiculoides), as particularly suitable, and they grow on the surface of water. The Mars habitat would have support the conditions of this food source, possible incorporating elements from greenhouse design or farming. Historically, space missions tend to have a non-growing food supply eating out of set amount of rations like Skylab, replenished with resupply from Earth. Using plants to effect the atmosphere and even enhance food supply was experimented with the 2010s aboard the International Space Station. Another issue is waste management. On Skylab all waste was put in a big tank; on Apollo and the Space Shuttle urine could be vented out into space or pushed away in bags to re-enter Earth's atmosphere. 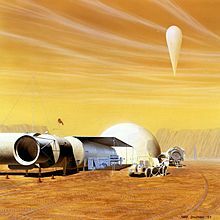 A Mars habitat is often conceived as part of an ensemble of Mars base and infrastructure technologies. Some examples include Mars EVA suits, Mars rover, aircraft, landers, storage tanks, communication structures, mining, and Mars-movers (e.g. Earth-moving equipment). A Mars habitat might exist in the context of a human expedition, outpost, or colony on Mars. In creating a habitat for people, some considerations are maintaining the right air temperature, the right air pressure, and the composition of that atmosphere. A concept to scrub CO2 from the breathing air is to use re-usable amine bead carbon dioxide scrubbers. While one carbon dioxide scrubber filters the astronaut's air, the other can vent scrubbed CO2 to the Mars atmosphere, once that process is completed another one can be used, and the one that was used can take a break. One unique structural force that Mars habitats must contend with if pressurized to Earth's atmosphere, is the force of air on the inside walls. This has been estimated at over 2000 pounds per square foot for a pressurized habitat on the surface of Mars, which is radically increased compared to Earth structures. A closer comparison can be made to crewed high-altitude aircraft, which must withstand forces of 1100 to 1400 pounds per square foot when at altitude. At about 150 thousand feet of altitude (28 miles (45 km)) on Earth, the atmospheric pressure starts to be equivalent to the surface of Mars. One of the challenges for a Mars habitat is for it to maintain suitable temperatures in the right places in an habitat. Things like electronics and lights generate heat that rises in the air, even as there are extreme temperature fluctuation outside. There can be large temperature swings on Mars, for example at the equator it may reach 70 degrees F (20 degrees C) in the daytime but then go down to minus 100 degrees F (−73 C) at night. Average −80 degrees Fahrenheit (−60 degrees Celsius). Polar locations in winter −195 degrees F (−125 degrees C). Here is a vision for habitats published by NASA from CASE FOR MARS from the 1980s, featuring the re-use of landing vehicles, in-situ soil use for enhanced radiation shielding, and green houses. A bay for a mars rover is also visible. A short term stay on the surface of Mars does not require a habitat to have a large volume or complete shielding from radiation. The situation would be similar to the International Space Station, where individuals receive an unusually high amount of radiation for a short duration and then leave. A small and light habitat can be transported to Mars and used immediately. Long term permanent habitats require much more volume (i.e. :greenhouse) and thick shielding to minimize the annual dose of radiation received. This type of habitat is too large and heavy to be sent to Mars, and must be constructed making use of some local resource. Possibilities include covering structures with ice or soil, excavating subterranean spaces or sealing the ends of an existing lava tube. A larger settlement may be able to have a larger medical staff, increasing the ability to deal with health issues and emergencies. Whereas a small expedition of 4–6 may be able to have 1 medical doctor, an outpost of 20 might be able to have more than one and nurses, in addition to those with emergency or paramedic training. A full settlement may be able to achieve the same level of care as a contemporary Earth hospital. One problem for medical care on Mars missions, is the difficulty in returning to Earth for advanced care, and providing adequate emergency care with a small crew size. A crew of six might have only trained at the level of Emergency medical and one physician, but for a mission that would last years. In addition, consultations with Earth would be hampered by a 7 to 40 minute time lag. Medical risks include exposure to radiation and reduced gravity, and one deadly risk is a Solar Particle Event that can generate a lethal dose over the course of several hours or days if the astronauts do not have enough shielding. The effect of radiation on stored pharmaceuticals and medical technology would have to be taken into account also. On some of the first crewed missions, three types of medications that were taken into orbit were an anti-nausea, a pain-killer, and a stimulant. By the time of ISS, space crew-persons had almost 200 medications available, with separate pill cabinets for Russians and Americans. One of the many concerns for crewed Mars missions is what pills to bring and how the astronauts would respond to them in different conditions. In 1999, NASA's Johnson Space Center published Medical Aspects of Exploration Missions as part of the Decadal Survey. On a small mission it might be possible to have one be a medical doctor and another be a paramedic, out of a crew of perhaps 4–6 people, however on a larger mission with 20 people there could also be a nurse and options like minor surgery might be possible. Two major categories for space would be emergency medical care and then more advanced care, dealing with a wide range concerns due to space-travel. For very small crews its difficult to treat a wide range issues with advanced care, whereas with a team with an overall size of 12–20 on Mars there could be multiple doctors and nurses, in addition to EMT-level certifications. While not at the level of a typical Earth hospital this would transition medical are beyond basic options typical of very small crew sizes (2–3) where the accepted risk is higher. One idea to enhance under-qualified crew who might need to perform an advanced surgery, is to have a robotic surgery machine on Mars which would be operated by a crew-member with help via telecommunications from Earth. Two examples of medical-care situations that been mentioned in regard to people on Mars is how to deal with a broken leg and an appendicitis. One concern is to stop what would otherwise be a minor injury becoming life-threatening due to restrictions on the amount of medical equipment, training, and the time-delay in communication with Earth. The time delay for a one way message ranges from 4 to 24 minutes, depending. A response to a message takes that time, the delay processing the message and creating a reply, plus the time for that message to travel to Mars (another 4 to 24 minutes). An example of spaceflight related health emergency was the inert gas asphyxiation with nitrogen gas aboard Space Shuttle Colombia in 1981, when it was undergoing preparations for its launch  In that case, a routine purge with nitrogen to decrease risk of fire lead to 5 medical emergencies and 2 deaths. Another infamous space related accident is the Apollo 1 incident, when a pure oxygen atmosphere ignited in the interior of space capsule during tests on the ground, three died. A 1997 study of about 280 space travelers between 1988 and 1995, found that only 3 did not have some sort of medical issue on their spaceflight. A medical risk for a Mars surface mission is how, after several months in zero gravity, they astronauts will handle operations on the surface. On Earth, astronauts must often be carted from the spacecraft and take a long time to recover. One idea for a Mars missions is a library sent to the surface of that planet. The Phoenix lander, which landed on the North polar surface of Mars in 2008, included a DVD library that was heralded as the first library on Mars. The Phoenix library DVD would be taken by future explorers who could access the content on the disk. The disc, both a memorial to the past and a message to the future, took 15 years to produce. The content on the disc includes Visions of Mars. One idea for exploration is knowledge arks for space, a sort of back-up of knowledge in case something happens to Earth. The Biodome 2 spaceflight and closed-loop biosphere test included a library with the living quarters. The library was positioned at the top of a tower, and known as Library tower. Another consideration for Mars habitats, especially for long-term stay, is the need to potentially deal with a meteor impact. The atmosphere is thinner so more meteors make it to the surface, so one concern is if a meteor punctured the surface of the habitat causing a loss of pressure or damaging systems. In the 2010s it was determined that something struck the surface of Mars, creating a spattering pattern of larger and smaller craters between 2008 and 2014. In this case the atmosphere only partially disintegrated the meteor before it struck the surface. Radiation exposure is a concern for astronauts even on the surface, as Mars lacks a strong magnetic field and atmosphere is thin to stop as much radiation as Earth. However, the planet does reduce the radiation significantly especially on the surface, and it is not detected to be radioactive itself. It has been estimated that sixteen feet (5 meters) of Mars regolith stops the same amount of radiation as Earth's atmosphere. For a 500-day crewed Mars mission NASA has studied using solar power and nuclear power for its base, as well as power storage systems (e.g. batteries). Some of the challenges for solar power include a reduction in solar intensity because Mars is farther from the sun, dust accumulation, and periodic dust storms, in addition to the usual challenges of solar power such as storing power for the night-time. One of the difficulties is enduring the global Mars dust storms, which cause lower temperatures and reduce sunlight reaching the surface. Two ideas for overcoming this are to use an additional array deployed during a dust storm and to use some nuclear power to provide a base-line power that is not effected by the storms. NASA has studied nuclear-power fission systems in the 2010s for Mars surface missions. One design was planned for an output of 40 kilowatts, and its more independent of the sunlight reaching the surface of Mars which can be effected by dust storms. Another idea for power is to beam the power to the surface, a solar power satellite would send the power down to the surface to a rectifying antenna (aka rectenna) receiver. 245 GHz, laser, in-situ rectenna construction, and 5.8 GHz designs have been studied. One idea is combine this technology to with Solar Electric Propulsion to achieve a lower mass that the surface solar power. The big advantage is that the rectenna's should be immune to dust and weather changes, and with the right orbit, a solar power Mars satellite could beam power down continuously to the surface. Technology to clean dust off the solar panels was considered for Mars Exploration Rover's development. In the 21st century there have been proposed ways of cleaning off solar panels on the surface Mars that are accumulating dust. The effects of Martian surface dust on solar cells was studied in the 1990s by the Materials Adherence Experiment on Mars Pathfinder. One early idea for a Mars habitat was to use put short stay accommodation in a Mars ascent-descent vehicle. This combination was called a Mars Excursion Module, and also typically featured other components such as basic rover and science equipment. Later missions tended to shift to a dedicated descent/ascent with a separate habitat. In 2013 ZA architects proposed having digging robots build a Mars habitat underground. They chose an interior inspired by Fingal's Cave and noted the increased protection from high-energy radiation below ground. On the other hand, the issue of the difficulty of sending digging robots that must construct the habitat versus landing capsules on the surface was also noted. An alternative may be to build above ground, but use thick ice to shield from radiation but with advantage that it lets visible light in. In 2015 the SHEE project noted the idea of autonomous construction and preparation for Mars habitat versus human construction. In early 2015 NASA outlined a conceptual plan for three stage Mars habitat design and construction award program. The first stage is a design only, then in the next stage a construction technology based using discarded spacecraft components is conducted, and finally building an actual habitat for Mars using 3D printing technology. In September 2015, NASA announced the winners of its 3-D Printed Habitat Challenge. The winning submission titled 'Mars Ice House' by Clouds Architecture Office / SEArch proposed a 3D-printed double ice shell surrounding a lander module core. Two European teams were awarded runner up prizes. The contenders explored many possibilities for materials, with one suggesting separately refining iron and silica from the Martian dust and using the iron to make a lattice-work filled in with silca panels. There were 30 finalists selected from an initial pool of 165 entries in the habitat challenge. The second-place winner proposed the printing robots build a shield out of in-situ materials around inflatable modules. Another NASA project that has developed extraterrestrial surface habitats is the X-Hab challenge and the Habitation Systems Project. The Sfero House by Fabulous also a contender in the 3D Mars Habitat program, featured levels above and below ground level. The proposed location was Gale crater (of Curiosity rover fame) with a focus on using both in-situ iron and water which would hopefully be available there. It has a double walled spherical design filled with water to both keep the higher-pressure of Mars habitat in, but help protect against radiation. In June 2018, NASA selected the top ten finalists of Phase 3: Level 1 in the 3D-Printed Habitat Challenge. Mock Mars missions or Mars analog missions typically construct terrestrial habitats on Earth and conduct mock missions, taking steps to solve some of the problems that could be faced for one on Mars. An example of this was the original mission of Biosphere 2, which was meant to test closed ecological systems to support and maintain human life in outer space. Biosphere 2 tested several people living in closed loop biological system, with several biological areas in support including rainforest, savannah, ocean, desert, marsh, agriculture, and in an area in support of a living space. The ISS has also been described as a predecessor to Mars expedition, and in relation to a Mars habitat the study importance and nature of operation a closed system was noted. Martin J.L. Turner (2004). Expedition Mars. Springer Science & Business Media. p. 298. ISBN 978-1-85233-735-3. At about 28 miles (45 km, 150 thousand feet ) Earth altitude the pressure starts to be equivalent to Mars surface pressure. Interior of the ESO Hotel which has been called a "boarding house on Mars", because the desert surroundings are Mars-like; it houses observatory staff at an observatory in the high Chilean desert. Illustration of plants growing in a Mars base. 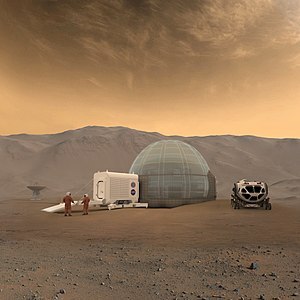 One example concept that is or is in support of habitat is a Mars biodome, a structure that could hold life generating needed oxygen and food for humans. An example of activity in support of this goals, was a program to develop bacteria that could convert the Martian regolith or ice into oxygen. Some issues with biodomes are the rate at which gas leaks out and the level of oxygen and other gases inside it. One question for Biodomes is how low the pressure could be lowered to, and the plants still be useful. In one study where air pressure was lowered to 1/10 of Earth's air pressure at the surface, the plants had a higher rate of evaporation from its leaves. This triggered the plant to think there was drought, despite it having a steady supply of water. An example of a crop NASA tested growing at lower pressure is lettuce, and in another test green beans were grown at a standard air pressure, but in low Earth orbit inside the International Space Station. To convert the entirety of Mars into a biodome directly, scientists have suggested the cyanobacteria Chroococcidiopsis. This would help convert the regolith into soil by creating an organic element. That bacteria is known to survive in extremely cold and dry conditions on Earth, so might provide a basis for bioengineering Mars into a more habitable place. As the bacteria reproduces the dead ones would create an organic layer in the regolith potentially paving the way for more advanced life. A study published in 2016 showed that cryptoendolithic fungi survived for 18 months in simulated Mars conditions. Pine trees have been suggested, in combination with other techniques for creating more hospitable atmosphere on Mars. In situ resource utilization involves using materials encountered on Mars to produce materials needed. One idea for supporting a Mars habitat is to extract subterranean water, which with sufficient power could then be split into hydrogen and oxygen, with the intention of mixing the oxygen with nitrogen and argon for breathable air. The hydrogen can be combined with carbon dioxide to make plastics or methane for rocket fuel. Iron has also been suggested as a building material for 3D printed Mars habitats. In the 2010s the idea of using in-situ water to build an ice for protection from radiation and temperature, etc. appeared in designs. 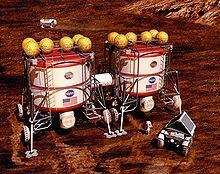 A material processing plant would use Mars resources to reduce reliance on Earth provided material. The planned Mars 2020 mission includes Mars Oxygen ISRU Experiment (MOXIE) which would convert Mars carbon dioxide into oxygen. To convert the whole of Mars into a habitat, increased would air could come from vaporizing materials in the planet. In time lichen and moss might be established, and then eventually pine trees. There is an theory to make rocket fuel on Mars, by the Sabatier process. In this process hydrogen and carbon dioxide are used to make methane and water. In the next step the water is split into hydrogen and oxygen, with the oxygen and methane being used for a Methane-Oxygen rocket engine, and the hydrogen could be re-used. This process requires a large input of energy, so an appropriate power source would be needed in addition to the reactants. ^ "Photo-s89_51054". Spaceflight.nasa.gov. Retrieved 2015-11-08. ^ a b c "3D-printable ice house could be our home on Mars". cnet.com. September 29, 2015. Retrieved 2015-11-20. ^ Fecht, Sarah (2015-09-16). "8 Printable Martian Habitat Designs That We Want To Live In | Popular Science". Popsci.com. Retrieved 2015-11-08. ^ a b c d Shubber, Kadhim. "Concept for underground Mars habitat marks dawn of Martian mole-people (Wired UK)". Wired.co.uk. Retrieved 2015-11-08. ^ "STRUCTURE magazine | Structural Challenges for Space Architecture". www.structuremag.org. Retrieved 2017-12-31. ^ a b c d "The Challenges of Climate Control in a Mars Habitat - Field Notes". Blogs.discovermagazine.com. 2013-07-15. Retrieved 2015-11-08. ^ "Eight Universities Selected for NASA's 2016 X-Hab Academic Innovation | NASA". Nasa.gov. Retrieved 2015-11-08. 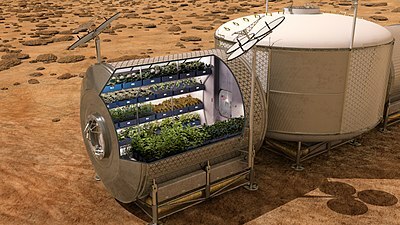 ^ "Greenhouses for Mars | Science Mission Directorate". science.nasa.gov. Retrieved 2018-01-08. ^ a b Bossinas, Les. "NASA - Multifunction Mars Base". www.nasa.gov. Retrieved 2018-02-20. ^ a b "The Caves of Mars - Martian Air Breathing Mice". highmars.org. Archived from the original on 24 July 2007. Retrieved 12 June 2015. ^ Courtland, Rachel (2015-09-30). "Suiting Up for the Red Planet - IEEE Spectrum". Spectrum.ieee.org. Retrieved 2015-11-08. ^ a b "A Solution for Medical Needs and Cramped Quarters in Space IVGEN Undergoes Lifetime Testing in Preparation For Future Missions". NASA. Retrieved 12 June 2015. ^ a b "What Medicines Would We Pack For A Trip To Mars?". IFLScience. Retrieved 2018-03-07. ^ a b Hollingham, Richard. "The grim and gory reality of surgery in space". Retrieved 2018-03-07. ^ a b c O'Neill, Ian (2017-02-08). "Mars Was Recently Hit by a Meteorite 'Shotgun' Blast". Seeker. Retrieved 2018-01-14. ^ "How Will Living On Mars Affects Our Human Body?". Space Safety Magazine. 2014-02-11. Retrieved 2018-01-14. ^ a b "NASA to Test Fission Power for Future Mars Colony". Space.com. Retrieved 2018-03-25. ^ Klotz,SPACE.com, Irene. "NASA Seeks Nuclear Power for Mars". Scientific American. Retrieved 2018-03-25. ^ a b c Curreri, Peter; Franklin Rose, M (2001-02-01). 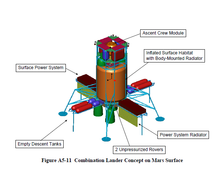 "Construction of Power Receiving Rectenna Using Mars- In-Situ Materials; A Low Energy Materials Processing Approach". ^ Spencer, Henry (17 November 2008). "Why don't the Mars rovers have dust wipers?". New Scientist. ^ "Mars cleaning tech offers method to sweep dust off Earth's solar panels". The American Ceramic Society. 25 August 2010. ^ Landis, G. A.; Jenkins, P. P. (1997). Dust on Mars: Materials Adherence Experiment results from Mars Pathfinder. Photovoltaic Specialists Conference. 29 September-3 October 1997. Anaheim, California. doi:10.1109/PVSC.1997.654224. ^ Matijevic, J. R.; Crisp, J.; Bickler, D. B.; Banes, R. S.; Cooper, B. K.; et al. (December 1997). "Characterization of the Martian surface deposits by the Mars Pathfinder rover, Sojourner". Science. 278 (5344): 1765–1768. Bibcode:1997Sci...278.1765M. doi:10.1126/science.278.5344.1765. PMID 9388171. ^ "UALR Particulate Science Research". University of Arkansas at Little Rock. 2013. Retrieved 20 February 2014. ^ a b "NASA Offers $2.25 Million For Martian Habitat Design - How Could This Contest Help People On Earth? : SCIENCE". Tech Times. Retrieved 2015-11-08. ^ a b "NASA Awards Top Three Design Finalists in 3D Printed Habitat Challenge | NASA". Nasa.gov. Retrieved 2015-11-08. ^ "MARS ICE HOUSE - Clouds Architecture Office". www.cloudsao.com. Retrieved 2017-03-22. ^ "3D-printed ice habitat concept for Mars draws acclaim from NASA". ScienceAlert. 2015-10-02. Retrieved 2015-11-08. ^ "Top 10 Mars habitats from NASA space habitat challenge". Telegraph. Retrieved 2015-11-08. ^ "NASA - eXploration Habitat (X-Hab) Academic Innovation Challenge". Nasa.gov. Retrieved 2015-11-08. ^ "NASA - Habitation Systems Project - NASA's Deep Space Habitat". Nasa.gov. 2012-12-11. Retrieved 2015-11-08. ^ "Meet the man working with NASA to 3D print a colony on Mars". CNN. 2017-02-22. Retrieved 2017-06-21. ^ a b Gillard, Eric (2016-12-13). "A New Home on Mars: NASA Langley's Icy Concept for Red Planet Living". NASA. Retrieved 2018-01-20. ^ a b Harbaugh, Jennifer (2018-06-28). "Top 10 Teams Selected in Virtual Stage of 3D-Printed Habitat Challenge". NASA. Retrieved 2018-07-14. ^ "Mock Mars mission: Utah habitat simulates life on red planet". CBS News. 2014-01-03. Retrieved 2015-11-08. 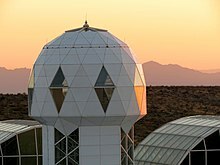 ^ "Biosphere II Project facts, information, pictures | Encyclopedia.com articles about Biosphere II Project". www.encyclopedia.com. Retrieved 2017-02-09. ^ a b Alling, Abigail; Van Thillo, Mark; Dempster, William; Nelson, Mark; Silverstone, Sally; Allen, John (2005-01-01). "Lessons Learned from Biosphere 2 and Laboratory Biosphere Closed Systems Experiments for the Mars On Earth Project". Biological Sciences in Space. 19 (4): 250–260. doi:10.2187/bss.19.250. ^ a b "Need Oxygen On Mars? Get It From Bacteria! : SCIENCE". Tech Times. Retrieved 2015-11-08. 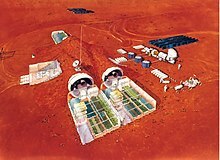 ^ [email protected] "NASA - Greenhouses for Mars". www.nasa.gov. Retrieved 2018-01-17. ^ a b c d "Greening of the Red Planet | Science Mission Directorate". science.nasa.gov. Retrieved 2018-01-14. ^ "Could fungi survive on Mars?". Christian Science Monitor. 2016-01-28. ISSN 0882-7729. Retrieved 2018-01-20. ^ Onofri, Silvano; de Vera, Jean-Pierre; Zucconi, Laura; Selbmann, Laura; Scalzi, Giuliano; Venkateswaran, Kasthuri J.; Rabbow, Elke; de la Torre, Rosa; Horneck, Gerda (2015-12-01). "Survival of Antarctic Cryptoendolithic Fungi in Simulated Martian Conditions On Board the International Space Station". Astrobiology. 15 (12): 1052–1059. Bibcode:2015AsBio..15.1052O. doi:10.1089/ast.2015.1324. ISSN 1531-1074. PMID 26684504. ^ Kellogg, Elizabeth A. (2013-07-22). "C4 photosynthesis". Current Biology. 23 (14): R594–R599. doi:10.1016/j.cub.2013.04.066. ISSN 0960-9822. PMID 23885869. ^ del Moral, Roger; Wood, David M. (1993). "Early Primary Succession on the Volcano Mount St. Helens". Journal of Vegetation Science. 4 (2): 223–234. doi:10.2307/3236108. JSTOR 3236108. ^ CNN, Ben Brumfield,. "Breathing perfect air on Mars is possible, study says - CNN". CNN. Retrieved 2018-01-20. ^ Bossinas, Les. "NASA - Multifunction Mars Base". www.nasa.gov. Retrieved 2018-02-21.